There was a tiny disturbance in the force, yesterday, as we lost our beloved lovebird, Nicky. It happened rather suddenly and, although we have no way of knowing for sure, the little trooper didn't seem to suffer too much or too long - I noticed he didn't look well on Tuesday - he was found comatose in the bottom of his cage on Wednesday morning. 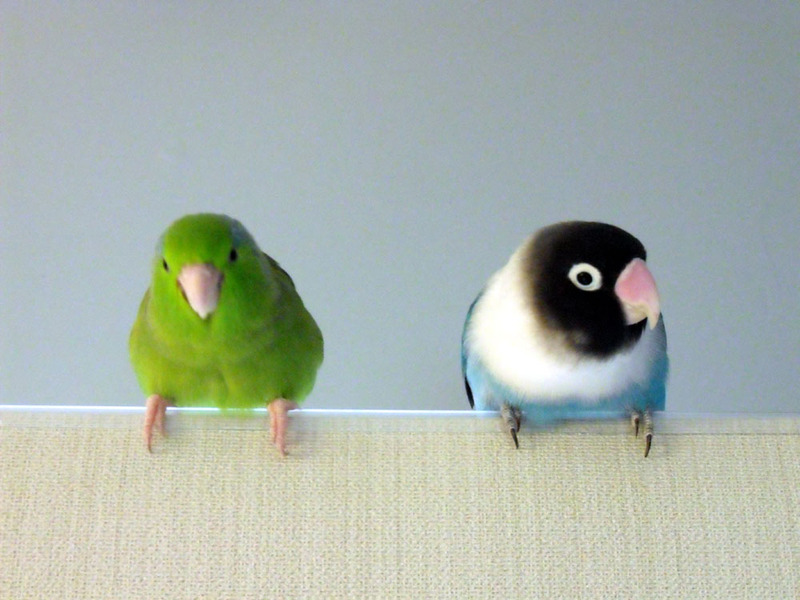 His beloved companion of four years, Baby the parrotlet, was by his side till the very end. I moved him to a comfortable spot and, true to form, he tried to bite me, but couldn't muster enough strength to sink his beak into my finger. That was when I knew the end was near. Baby snuggled with him until his spirit departed. Then she flew up to a high perch from which she has been screaming mournfully ever since. The sound she is making, almost 24 hours later, is reminiscent of the calls Nicky made when Baby escaped her cage a couple years ago and was flying around in our backyard. He was a homing beacon for her then, and we have always credited him with saving her, as she finally returned to him some 3 1/2 hours later. He was a clever guy, constantly working on removing the bars of his cage and succeding a couple times, ringing his bell, and dragging the stripped remnants of his millet spray up into his tent to make a nest for his partner. Whenever we would let him out, he would land on my shoulder and plant love-bites on my neck. We will miss you Nicky. You were our hero. We lost a bird yesterday (Wednesday) also. One of our spice finches passed last night. A finch is not as much a personality and family member as a parrot or love bird, but his partner was making the saddest sound I've ever heard them make. Do animals, even small feathered ones, feel love and loss? I have no doubt. I felt that way when my bird died. He was at the bottom of the cage and I was like "this is a joke, isn't it?". I don't doubt it, either. I have even seen mourning behavior by the flock when we have lost a chicken.